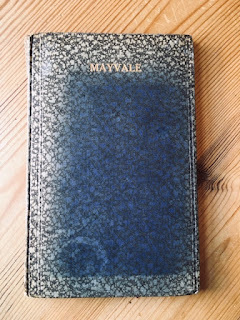 Mayvale (1915) is a slim volume of 44 pages in mottled royal blue boards with its title in gilt lettering. My copy has faded around the edges, leaving a panel of deep blue in the middle, like a night sky seen through an attic window. In one corner of this is a ring-mark, from some long-ago cup or glass, and its ghostly sphere now looks like a crescent-moon, waxing. It is very scarce in this book form, or indeed any form at all. Co-written by H.E. Clifton and James Wood, it is notable for its preface by Wyndham Lewis, one of his earliest pieces, in fact among his first publications in a book. Lewis had earlier devised his album of illustrations to Timon of Athens, and two issues of his Vorticist journal Blast! There is a passing reference to wanting to hear about the preface in a letter from T S Eliot to Lewis of circa November 1915. 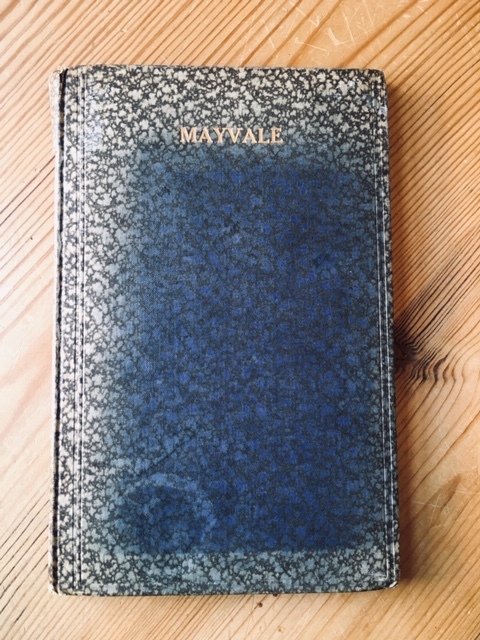 ‘Mayvale’ first appeared in the one penny varsity newspaper The Cambridge Magazine, vol 5 no 8 (4 December 1915) and this appears to be a bound offprint from that, with a two page advertisement for the magazine at the end. The paper is described in these notices as ‘a leader in progressive thought of the younger generation’. This offprint volume is dated by the British Library to 1915 too. That is to say, people, places and incidents are described, but with no attempt to evoke their inner meaning or interpret them. The effect is therefore photographic, like sifting through a sequence of black-and-white snapshots, leaving the reader to consider what each scene means, if anything. The setting is a coastal town and a minor private school, and follows a boy’s arrival there, late because of a rock-fall on the railway line, and then the masters and scholars he encounters. Although a few desultory things happen, they are presented in the same even, detached tone throughout: there is not exactly a plot, and the ending is inconsequential. It seems to me likely that some of the figures in the book are portraits of Cambridge contemporaries or possibly even those involved in Lewis’ art circles. This is a very early example of English experimental writing, and seems now like a harbinger of later avant-garde prose such as Christopher Isherwood and Edward Upward’s Mortmere stories. (These also include scenes at a private school and a railway accident, which is either a curious coincidence or an intentional tribute). Some of the passages in Mayvale have an eerie beauty and the effect of the technique is, curiously enough, not realism, but a drifting, dreamlike atmosphere. Lewis evokes the ‘vague and demure behaviour that it chooses, it leaves you with Norfolk jackets with outside pockets, a kiss (that might have been sulphurous, but was probably Pierrotesque), the rings of a white-haired old gentleman.’ Mayvale, while it apparently simply describes observable encounters and occurrences, also makes these everyday things seem uncanny, charged with meaning. ‘The restlessness of closed lives crossed for a moment, have been put together for you,’ avers Lewis, calling the piece ‘a rather beautiful refuse.’ It would be absurd, Lewis concludes, to become interested in any person or thing in the story, but (as he clearly knew) in fact the reader does: and not only that, the reader may well be induced by the technique to see the people and things around him anew, with the same objective and curious gaze as the book. Of the two authors, it seems possible that H E Clifton was Hubert Everard Clifton MC (1891-1916), a Lieutenant in the Devonshire Regiment who died at the Fort Pitt Military Hospital, Chatham of pneumonia after being wounded in action during the Battle of the Somme. Clifton was born in Loughborough on 18 July 1891, the son of a Wesleyan minister. He went to the Magnus Grammar School, Newark and The Rydal Mount School at Colwyn Bay: the latter could well have provided some of the seaside and school scenes in Mayvale. He then entered Trinity College, Cambridge, in October 1910 and was awarded a BA in 1913. A law student, he intended to train for the profession but joined up when war broke out. He is described as “an exceptionally clever caricaturist”, a skill involving the same sort of keen observation evidenced in the prose, and which may also support the idea that the characters in Mayvale are based on people he knew. Although he had left Cambridge by the time of the publication of the piece, he was not posted to France until June 1915, and so may have kept up his associations with the university: the Cambridge Magazine was taken by many ex-students, and copies could be found as far afield as Egypt and India. Its contributors were also drawn from a wide literary field, not solely from current undergraduates. As to Clifton’s partner in prose, James Wood, he may be a J E H Wood of St John’s College, Cambridge, who read Classics there in 1913, but I have not so readily found any further information about him. It appears that this strange, singular work was the only publication of either author. With thanks to Adam Green, Senior Assistant Archivist, Trinity College Library, Cambridge for help with information about H E Clifton and J E H Wood. Biographical details about H E Clifton principally from the Nottinghamshire County Council war memorial website.